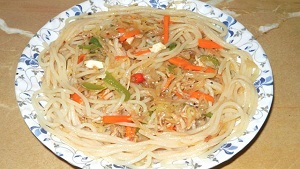 Rice Noodles in Fish Sauce Recipe in English is an easy and traditional cooking recipe to prepare at home. It provides you an awesome taste of Sea Food Recipes. Soak noodles in hot water. After 20 minutes sieve the water. Thoroughly mix lemon juice, fish sauce, sugar and chilli paste in a bowl, so that sugar dissolves completely. Heat olive oil in a pan, add onion and fry till it turns golden. Add mince in the pan and fry. When it changes color, add salt and black pepper. Mix well. Add spring onions, half the basil leaves, and prepared sauce. After cooking for 2-3 minutes take it out in a dish, garnish with the remaining basil leaves and ready serve.